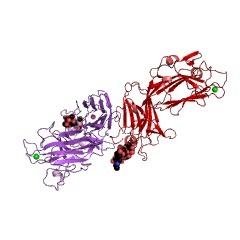 This novel putative carbohydrate binding module (NPCBM) domain is found at the N-terminus of glycosyl hydrolase family 98 proteins. 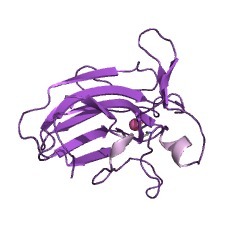 This entry represents a putative carbohydrate binding module (NPCBM) domain found at the N terminus of glycosyl hydrolase family 98 proteins [(PUBMED:16212961)]. 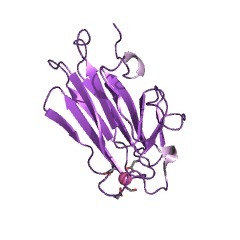 Proteins containing this domain include CpGH98 from C. perfringens. 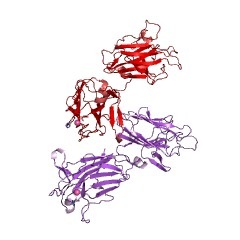 It specifically hydrolyses fucose-containing trisaccharides from the glycotopes of blood groups A and B and is implicated for the infectivity and virulence of this pathogen [(PUBMED:15618227)]. 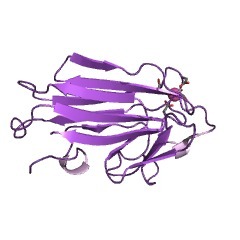 CpGH98 has a central TIM barrel catalytic domain, in which putative catalytic residues may be tentatively identified, and an N-terminal novel putative carbohydrate binding module (NPCBM) [(PUBMED:15618227)]. There are 1788 NPCBM domains in 1400 proteins in SMART's nrdb database. Taxonomic distribution of proteins containing NPCBM domain. This tree includes only several representative species. The complete taxonomic breakdown of all proteins with NPCBM domain is also avaliable. Click on the protein counts, or double click on taxonomic names to display all proteins containing NPCBM domain in the selected taxonomic class. This information is based on mapping of SMART genomic protein database to KEGG orthologous groups. Percentage points are related to the number of proteins with NPCBM domain which could be assigned to a KEGG orthologous group, and not all proteins containing NPCBM domain. Please note that proteins can be included in multiple pathways, ie. the numbers above will not always add up to 100%. 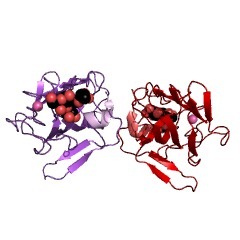 2vng Family 51 carbohydrate binding module from a family 98 glycoside hydrolase produced by Clostridium perfringens in complex with blood group A-trisaccharide ligand. 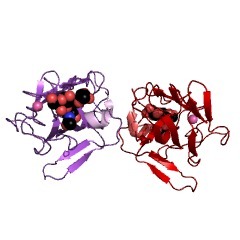 2vno Family 51 carbohydrate binding module from a family 98 glycoside hydrolase produced by Clostridium perfringens in complex with blood group B-trisaccharide ligand. 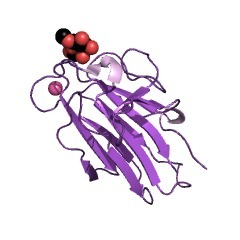 2vnr Family 51 carbohydrate binding module from a family 98 glycoside hydrolase produced by Clostridium perfringens.